* The Egyptian state prosecutor orders that ousted President Morsi be charged with collaborating with Hamas, Egypt’s official MENA news agency reported yesterday. * The Associated Press: Egypt’s new government has imposed the toughest border restrictions on the Hamas-run Gaza Strip in years, sealing smuggling tunnels, blocking most passenger traffic and causing millions of dollars in economic losses. * Palestinian Ma’an news agency: First Egypt closed the land border with Gaza and now the Egyptian government has banned Palestinian fishing along the northern coast of Sinai (whereas Israel has always permitted fishing off of that coast). * Tom Gross: Where’s the international outrage? The usually highly vocal, Western government-funded, and supposedly pro-Palestinian NGOs, are suddenly silent about the Egyptian-imposed suffering on Gazans. * Where next for Qatar? Since the discovery of oil in 1941, Qatar has become rich beyond its dreams, with the highest GDP per capita on earth. Along with great wealth, Qatar’s brand new ruler has just inherited the world’s most famous television station, Al Jazeera. And therein lies the problem. The emirate has no coherent policy. * The former emir adorned Doha with Western jewels, including the 2022 World Cup, Qatar-owned European soccer teams, a branch of the Guggenheim museum, outposts of prestigious American universities and research institutions, like Georgetown, Cornell, and Brookings. Pretty much all of the soft power and prestige was made possible by a single investment he made in 1996 with the creation of an Arabic-language satellite news network that allowed him to project power far beyond the natural ability of his modest emirate. * Qatar’s grand strategy seems to be only to aggravate its much larger and richer neighbor, Saudi Arabia. * Qatar gave radical Muslim Brotherhood preacher Yussuf al-Qaradawi an electronic pulpit with his own show on Al Jazeera. When the Brotherhood came to power in Egypt, Qatar invested its money and prestige in the Brotherhood, helping keep Mohamed Morsi’s government afloat with more than $8 billion in aid. And now Morsi and the Brotherhood are gone, and the rest of Egypt is mad at Qatar and Al Jazeera. * Turkey’s fears of an autonomous Kurdish region in Syria are not justified. The 20-year history and experience of Iraqi Kurdistan testifies that an autonomous Kurdish region is not a threat to any of its neighbors. On the contrary, it can be a stabilizing factor in the region. * A stable Syrian Kurdistan could also give Turkey great economic opportunities. It would be yet another market for Turkish exports. About 60 percent of Syria’s oil is located in the Kurdish areas. Ankara can access these fields in the future, the same way it is doing in Iraqi Kurdistan. * Turkey is not interested in a diplomatic reconciliation with Israel, but rather in humiliating it and bringing it to its knees, Israeli officials said on Thursday, after the Turkish deputy PM’s remarks. Tom Gross:: I attach a variety of articles from the last few days concerning Qatar, Egypt, Gaza, Turkey and the Syrian Kurds. Last month the 61-year-old emir of Qatar, Hamad bin Khalifa Al Thani, stepped aside to make room for his son, 33-year-old Tamim bin Hamad bin Khalifa Al Thani. While there are few details out of Doha, the assumption is that Sheikh Hamad, long rumored to be ill, feels death on his doorstep. He passed power on to his son now to avoid the sort of succession crisis that often plagues the Persian Gulf’s Arab monarchies. Along with great wealth, Qatar’s new ruler has inherited the world’s most famous television station, Al Jazeera, which since its 1996 inception has been seen by many as largely reflecting Qatari interests. And therein lies the problem. While some commentators have argued that the young emir is taking the helm at an opportune time, in reality what can be divined from Al Jazeera is that the emirate has no coherent policy. The paradox then is that for the young emir to build on the legacy his father has left, he will have to reject much of it. After the model of advice to untested Renaissance rulers, this week Agents of Influence offers counsel to the rising emir. Congratulations, your excellency, for the maker of all things has favored you from birth, in place and parentage. Since the discovery of oil in 1941, Qatar has become rich beyond your ancestors’ dreams, thanks to the liquefied natural gas of which it is the world’s largest exporter. Of your tiny emirate’s almost 2 million inhabitants, you need share the wealth only among the one-eighth of the population that are Qatari nationals, giving your subjects the highest GDP per capita on earth. The rest – the construction workers from the Asian subcontinent who build your skyscrapers and the European lawyers and executives who steward Qatar’s dreams – seem content with the fact that they are much better compensated in Doha than they ever could be at home. 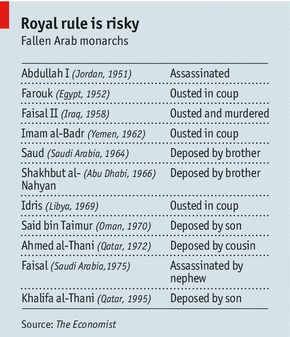 Your father was only a few years older than you when he removed your grandfather in a bloodless coup in 1995. He made Qatar what it is today, but what really seems to have made him is your mother, Sheikha Moza, the emir’s second wife and his favorite. The region’s rumor mill whispers that it was she who not only sought your advancement, but ensured your survival by arranging for your uncle, Hamad bin Jassem Al Thani, to be retired with your father’s abdication. Your mother, who one imagines would have had no trouble navigating the political intrigues of an Ottoman harem, recognized that the ambitious man who served your father as prime minister and foreign minister would otherwise stand as a threat to you after your father’s imminent death. Now that the realm is secured, it is time to take inventory of your assets. The former emir adorned Doha with Western jewels, including the 2022 World Cup, European soccer teams, a branch of the Guggenheim museum, outposts of prestigious American universities and research institutions, like Georgetown, Cornell, and Brookings. All of the soft power and prestige your father won was made possible by a single investment he made in 1996 with the creation of an Arabic-language satellite news network that allowed him to project power far beyond the natural ability of your modest emirate. Indeed, what began with the Sept. 11 attacks might best be described as the “Al Jazeera Decade.” When Al Jazeera journalists transmitted messages from Osama Bin Laden and his colleagues and sided with anti-American and pro-Saddam forces after the 2003 invasion it angered the Americans and thereby galvanized the Arabs, raising the station’s profile. There was finally, it seemed, a TV station that broadcast Arab power and dignity, outrage and resistance throughout the world. It’s sometimes said that Al Jazeera reflects the policy of Qatar – this may be true, insofar as Qatar appears to have no discernible policy. It’s true that, in foreign affairs, as the Americans and Europeans are fond of saying, there are no permanent friends, only permanent interests – and Qatar’s grand strategy seems to be only to aggravate your much larger and richer neighbors in Saudi Arabia. Qatar’s policies are variable as the wind. Your father visited Gaza to invest hundreds of millions in support of Hamas, while he was also on friendly terms with the Jewish state that Hamas wishes to destroy. You share the world’s largest natural gas field with your Iranian neighbors while you host the United States military’s central command. To you, a military man, this toying with larger powers perhaps seems dangerous. Having graduated from Sandhurst, surely you understand that, were it not for your alliance with the Americans, a platoon of Swiss Guard bearing only their ceremonial lances could overrun your country’s Pakistani-led armed forces in a matter of hours. The emir and the prime minister saw time and again the limits of their ability to shape the world around them. At first, Qatar helped rebuild areas demolished in the 2006 war with Israel and brokered an agreement favorable to Hezbollah after the group turned on their Sunni countrymen in 2008. And yet after the uprising against Hezbollah ally Syrian President Bashar al-Assad broke out in March, 2011, your predecessors had a change of heart: They dropped Assad and Hezbollah and chose instead to arm and fund their adversaries. The fact that the arms and cash Qatar provided Brotherhood-affiliated rebel units has not brought Assad’s demise any closer, while angering the White House, is yet more evidence that Qatari influence is written in water. It seems that with the outbreak of the Arab Spring, your father and uncle believed that the Muslim Brotherhood’s time had finally come, a likely boon to Doha, too. Ever since the 1950s, when Egyptian President Gamal abd el-Nasser scattered the Brotherhood across the globe, Qatar has appeared to welcome Islamists. Your father gave Brotherhood preacher Yussuf al-Qaradawi an electronic pulpit with his own show on Al Jazeera. When the Brotherhood came to power in Egypt, Qatar invested its money and prestige in the Brotherhood, helping keep Mohamed Morsi’s government afloat with more than $8 billion in aid. And now Morsi and the Brotherhood are gone, and the rest of Egypt is angry with you. But the point is not the money or the anger. So what if lots of Egyptians are mad at Qatar and Al Jazeera? Your father and uncle saved them from starving, and the reality is that just as Egypt’s initial blandishments turned to curses, they may soon again turn to praise. The history of your region shows it is unwise to put too much stock in popular acclaim. What matters is reputation – Qatar backed another loser. In spending its prestige so carelessly, Qatar has earned contempt. Your father and uncle seemed to have seen the world like PR flacks. They were always happy to see their names in bold print and supposed that any publicity was good. They seemed interested in a variation on what American media experts used to call “synergy.” In the 1990s, the idea was for large conglomerates to master various forms of media – from music to books, and television to information technology. Similarly, your father and uncle seemed to want to marry news coverage to political gambits. Former Italian Prime Minister Silvio Berlusconi and the outgoing mayor of New York Michael Bloomberg mastered the technique of creating self-fulfilling prophecies. For them it was not magic but an advanced stage of political warfare. The difference between them and your father and uncle is that they actually controlled the political systems of the institutions they sought to shape through the coverage of their media organizations. Because Qatar has no such control over a political network as unwieldy as the Middle East, your father and uncle’s bets merely undermined the power of the network. The other option is to forget about the magic and make Al Jazeera a real broadcast network, not reflecting Qatar’s fitful ambitions and political amusements, but embodying the values of a real country. The Egyptian state prosecutor ordered that ousted Islamist President Mohammad Morsi be detained for 15 days for questioning on charges of collaborating with Palestinian militant group Hamas, official MENA news agency reported on Friday. Morsi will be asked on whether he worked with Hamas in attacks on police stations and prison breaks in early 2011, during which the Islamist and other political inmates escaped during the revolt against strongman Hosni Mubarak, it added. State accusations against Morsi include killing prisoners and officers as well as kidnapping soldiers, said MENA. The case concerns the mass jailbreak of dozens of Brotherhood officials during the uprising that toppled Morsi’s predecessor, Mubarak. There have been many reports in Egyptian media that the Brotherhood collaborated with Hamas – which has condemned Egypt’s decision to detain Morsi. The report came just hours before people were expected to take to the streets in mass rallies for and against the ousted president. Egypt’s army has been holding Morsi in an undisclosed location since deposing him on July 3. GAZA CITY, Gaza Strip (AP) – Egypt’s new government has imposed the toughest border restrictions on the Hamas-run Gaza Strip in years, sealing smuggling tunnels, blocking most passenger traffic and causing millions of dollars in economic losses. Some in Hamas fear the movement is being swept up in the same Egyptian military campaign that earlier this month toppled the country’s democratically elected Islamist president, Mohammed Morsi – like the Gaza rulers part of the region’s Muslim Brotherhood. Egypt’s military has said the Gaza restrictions are part of its security crackdown in the Sinai and has not suggested it is trying to weaken the Hamas government or bring it down in the process. Past predications that Gazans fed up with the daily hardships of life under blockade will rise up against Hamas have not materialized. However, the new Gaza border restrictions are tougher than any enforced by Morsi’s pro-Western predecessor, Hosni Mubarak, a foe of Hamas and the Muslim Brotherhood, according to Gaza residents and Hamas officials. And an ongoing border closure is bound to further weaken Hamas’ popularity in Gaza, as the economy takes a new hit and Gazans are once again unable to travel. “It’s getting worse every day,” Gaza City taxi driver Khaled Jaradeh said of the shortage of cheap Egyptian fuel caused by the closure. Jaradeh was waiting in a slow-moving line outside a gas station, with about 30 cars in front of him. “Even when Mubarak was president, we used to get fuel through the tunnels,” Jaradeh said. At the time of Morsi’s ouster, some officials in Palestinian President Mahmoud Abbas’ Fatah movement, Hamas’ main rival, privately expressed hope that the Hamas government would be next. Some Egyptian media outlets have described Hamas as a troublemaker aiding Muslim militants in Egypt’s lawless Sinai peninsula, next to Gaza. Morsi is believed to have held back on security clampdowns for fear of angering more radical supporters. Speaking privately, a senior Hamas official who frequently deals with the Egyptian authorities stopped short of saying Egypt’s military is intentionally trying to weaken Hamas rule in Gaza through the new restrictions. However, he said he views the Gaza clampdown as part of an attempt by the Egyptian army to justify its continued campaign against the Muslim Brotherhood in Egypt. Authorities in Egypt moved quickly against the Brotherhood after Morsi’s July 3 ouster. They arrested several of the group’s leaders, and have kept Morsi incommunicado at an undisclosed location. Sinai militants have taken advantage of the turmoil and launched daily attacks against Egyptian security forces, killing more than a dozen soldiers and policemen this month alone. The clampdown and the Sinai violence are only intensifying. In Egypt, newspapers – many known for their anti-Morsi stance – are full of talk about Hamas. They repeatedly carry poorly sourced reports of Hamas’ alleged involvement in Egypt’s affairs. Egypt’s state-run Al-Ahram newspaper raised eyebrows with a front-page article this week that claimed Morsi would be detained on a number of charges, including phoning Hamas leaders days before his ouster to alert them to prepare attacks in northern Sinai against the military and police. Egypt’s top prosecutor dismissed the article as unfounded, and the paper’s editor-in-chief was questioned by prosecutors. The steady campaign against Palestinians by some of Egypt’s state-owned and liberal media intensified after authorities said Palestinians, along with Syrians, were detained in violent pro-Morsi protests in recent weeks. No further details were given. TV talk shows have also fueled the anti-Palestinian rhetoric. A guest on one claimed that Morsi is of Palestinian origin, while another said it would soon provide proof that Hamas was behind a Sinai attack that killed 16 Egyptian soldiers last year. It’s not clear how long the Egyptian clampdown on Gaza will continue, though in Egypt’s current climate it appears unlikely the restrictions will be eased anytime soon. EL-ARISH, Egypt (Ma’an) – Egypt has prohibited fishing off the coast of northern Sinai as a security measure to stop militants entering the peninsula by sea. Egyptian security officials told Ma’an that the decision aims to prevent Palestinians and members of militant groups from entering Egyptian territory. The ban will continue indefinitely, officials said, and will affect fishermen in El-Arish, Rafah and other northern coastal areas. Since a crackdown on smuggling tunnels two months ago, people have increasingly begun entering Egypt using fishing boats, usually at night. Egyptian coast guards recently intercepted a boat carrying 10 Palestinians, six of whom managed to escape. Four of the men arrested were said to belong to a militant Jihadist group in Gaza, officials said. Since the military coup that toppled Morsi after massive nationwide protests against his rule, militant groups have launched almost daily attacks on troops and police in Sinai. Several members of the security forces have died in the unrest, as well as two Egyptian Christians, one of whom was found decapitated five days after being kidnapped. Analysts attribute the Sinai violence to Islamist extremists seeking to take advantage of the political insecurity in the country after Morsi’s removal. Turkey’s Options in Syria: Stable Kurdish Self-Rule or Jihadist Enclave? Turkey’s unease over armed Kurdish fighters just across the border in Syria has been turning into alarm, especially after the Kurdish People’s Defense Units (YPG) recently routed the radical Islamic Jabhat al-Nusrah in Serekaniye, and recaptured the Kurdish border town. Hours after the fierce fighting for Serekaniye (also known as Ras al-Ayn), YPG fighters showed reporters passports seized from Islamist guerrillas, noting they had traveled through Turkish airports on different passports, including American and of several Arab countries. It goes without saying that, from the beginning of the Syrian uprising more than two years ago, Turkey’s Islamist government – the Justice and Development Party (AKP) – has facilitated the arrival of jihadist fighters from across the Muslim world, and supplied them with weapons and field hospitals. Turkey’s unease turned to alarm on July 19, when officials of the dominant but controversial Democratic Union Party (PYD) announced their intention of declaring autonomy. On the other hand, since the Kurdish fighters have been gaining strength in Syria in the face of Arab rebels, the Turkish army has been building up its presence with heavy weaponry at the border. Its unmanned drones scan the area. This is not the first time Turkey reacts to events in the PYD-controlled areas of Syria. Ankara is deeply suspicious over the PYD’s close ties to the militant and outlawed Kurdistan Workers Party (PKK) in Turkey. The PYD is accused of surreptitious ties with Syrian President Bashar al-Assad’s regime and holds sway over most of Syria’s Kurdish regions. Turkey has already warned that, although it did not react when Iraqi Kurds declared autonomy, Ankara would not just stand by if Syrian Kurds made a similar bid. Though the Turkish military has beefed up border forces and gone on alert in response to Kurdish developments in Syria, it did not react similarly when fighters of the Free Syrian Army (FSA) and Al-Qaeda affiliates controlled the area until several weeks ago. It is important to ask if Turkey’s fears of an autonomous Kurdish region in Syria are really justified. Is it foreign Islamist fighters that pose a threat to Syrian stability, or is it a Kurdish free enclave that threatens the region? The 20-year history and experience of Iraqi Kurdistan testifies that an autonomous Kurdish region is not a threat to any of its neighbors. On the contrary, it can be a stabilizing factor in the region. Initially Turkey, Iran, Iraq and Syria were apprehensive of Iraqi Kurdistan’s self-rule. But now proven wrong, they should weigh twice their suspicions about the Syrian Kurds and their ambitions for autonomy. If Kurds run their eastern areas in Syria, the world will have one less jihadist enclave to worry about. A stable Syrian Kurdistan could also give Turkey great economic opportunities. It would be yet another market for Turkish exports. Approximately 60 percent of Syria’s oil is located in the Kurdish areas. Ankara can access these fields in the future, the same way it is doing in Iraqi Kurdistan. At this time, it would be wiser if Syria’s Kurds did not defer to Turkish fears and continue to keep jihadist fighters at bay. Turkey’s threats to cross the border militarily could well be nothing but a bluff. A second course of action would be to engage Ankara diplomatically and reassure the Turks that a Kurdish entity will not endanger Turkey’s national security or economic interests. PYD leader Salih Muslim has already made some conciliatory statements to Turkey. But he could do more. He could tell the Turks of the future plans of the Kurds across the border. On the other hand, leaders of Iraqi Kurdistan can and should mediate between PYD and Ankara, to ensure that the two sides do not go to war. Turkey is not interested in a diplomatic reconciliation with Israel, but rather in humiliating it and bringing it to its knees, Israeli officials said on Thursday. The comments came after Deputy Prime Minister Bulent Arinc told the Turkish media that the reason for the deadlock in compensation talks with Israel over the 2010 Mavi Marmara incident was that Jerusalem was not willing to admit that the compensation payment was the result of a wrongful act. Up until now the assumption was that the two sides were not yet normalizing ties because they could not agree on the size of the compensation package, with the Turks demanding much more than Israel was willing to pay. But Arinc, leading the Turkish team in the three rounds of talks that have already been held, said earlier this week that money was not the issue. “In our first meeting [the Israelis] showed no opposition to this. But in the second meeting, they intended to give an ex gratia payment [one made without the giver recognizing any liability or legal obligation] as a form of reparation because they fear compensation [as a result of their wrongful act] will set an example for other cases, which is not a concern to us,” the Turkish daily Hurriyet reported him as saying. On March 22, just as US President Barack Obama was leaving Israel after his visit and at his urging, Prime Minister Binyamin Netanyahu called Turkish Prime Minister Recep Tayyip Erdogan and offered an apology for any operational errors that might have led to the death of nine Turkish activists on the Mavi Marmara ship trying to break the blockade of Gaza in 2010. “The amount of money is not the problem,” Arınc said. “There are two problematic areas. The first one is that Israel should accept that it’s paying this money as a result of its wrongful act. Nothing less than this will be accepted. And second, we are waiting for them to realize our third condition of cooperating with Turkey is making life conditions easier for Palestinians. We are not talking about the amount of money as our first two conditions have not been met,” he added. One Israeli official said that Arinc’s comments reveal that Ankara is not genuinely interested in settling the dispute over the Mavi Marmara with Israel, but rather the aim is to humiliate Jerusalem. The official said that the formula for the apology was very carefully crafted, so as not to admit any Israeli legal culpability. Now, he said, this is no longer enough for the Turks. Regarding lifting the blockade on Gaza, Israel has made clear that it has no intention of doing so, and that it will ease restrictions there to the degree that the rocket and missile fire from the area into Israel stops. One senior Israeli official, when asked several weeks ago about the Turks apparent adding on conditions before returning their ambassador to Israel, replied that “enough is enough,” implying that Israel did what it felt it had to do to try and improve the ties with Turkey, but would go no further. One Israeli official said on Thursday that while there was US pressure in the past on Israel to make gestures to reconcile with Turkey, there are currently no such demands. Netanyahu did what the Americans expected him to do, the official said, and from their standpoint this whole episode should now be over.